Hi! I am excited to be joining the Technique Junkies Design Team today in celebration of the launch of the NEW Great Gifts CD from The Technique Junkie Newsletter! The CD contains 40 papercrafting projects with gifts for all occasions. There are boxes, bags, surprises and even explosions on this CD! The CD is just $14.95 plus postage. A full list of what is on the CD – with pictures of each project – is available HERE. Use the link below to order. *If you started here, you may want to head back to the Design Team blog, so you can see all of the gorgeous artwork from the beginning. If you arrived here from Jackie's blog, you are in the right place! The Project I am featuring is The Kimono Gift Card. This card was quick and easy : ) I used the New Bird Song papers from Graphic 45. The ribbon is colored with a Copic marker to match the trim. The trim is from the stripe on one of the papers in the Bird Song paper pack. I hope you will join in the challenge! Every entry qualifies you for a chance to win $20 of items from the store at Sweet Stamps, and if you use a Sweet Stamps image- you will receive an additional chance to win! Please note- there is a limit of 10 challenges for each entry.The winner is chosen by Random.org- so everyone has a chance to win! Stop by the Sweet Stamps Challenge Blog HERE to see what the rest of the DT has created for the Challenge or click on the links below. The directions for this card are in the Technique Junkies Feb/March newsletter- it is called Torn Window. I stamped the image in browns using the Rock and Roll method, and sponged in color onto the tree. (I stamped a 2nd image and roughly cut out the tree outline, and sponged thru the negative of the cut out....). I punched a scalloped oval and sponged on the Ranger ink for the clouds. I die cut the leaves- I took a close up- can you see the detail in the die cuts? I am in a blogging group at SCS called Stamp Addicts. We have a CASE challenge and I am way over-do on a couple of the CASE's..... One of the members is a fabulous Copic artist- and I thought coloring Japanese Tilda would be a good challenge to CASE Marilyn- you can see what I mean if you visit her Blog One Stamping Fool . Goodness, her coloring is out of this world beautiful! Yep! So, I used the W's and some R's on Japenese Tilda plus some skin colors in E's + R20. I used Kraft cardstock and some Crumb Cake DSP from SU under my favorite Cheery Lynn Border Die. So, the coloring here does not come close to Marilyn's, but I am happy with how this card came out. I decided to use this card for my Just One Swap for the Technique Junkies. The background I layered the image on is called Colorwash Alcohol- I love this for the depth that is achieved. The technique Barb used on the bottom of the card is called Tissue Tape using a Stamps of Life set. I love the colors, the stamps and the fun technique Barb used. Papertake Weekly- Things that make you go Awwwwww! Use it Tuesdays- Anything Goes w/ Hoarded Supplies......Colorwash and the Tilda- I have had it soooooo long! That's all for tonight! If you happen to stop by Marilyn's One Stampin Fool Blog to drool....I mean admire her beautiful coloring, tell her Shelly says Hello! I had to have this beautiful stamp set by Stampin Up- and it was gifted to me by a sweet friend : ) So, when I went to make a special card for a friend- I took it out and inked it up! I just LOVE hydrangia's! The background- you guessed it- Technique Junkies technique called Colorwash Alcohol. The image is colored with Copics, then I added dots if ink using Itty Bitty Backgrounds-also from SU. This week at the Sweet Stamps Challenge we are making cards "For the Guys"
I looked in the new Technique Junkies newsletter and found a technique I had not tried yet- Pulled Color. Wowza- I made a few of the backgrounds using different colors. My last shopping trip at Sweet Stamps, I picked up the boat die by Marianne (199 Classic Boat Die) . It reminded me of a boat ride my husband and I took in China. (There is also a sailboat in the set...). I have to share some pictures-see below- then you will really see how the card means alot-and my husband will love this! But first, here is how I made the card- after I made the background, I die cut the boat. The boat is cut out of Coordinations cardstock, then embossed. The raised portion was sanded. Now, for the greenery, I needed the right leaves- so I embossed Green cardstock in the Bamboo embossing folder, highlighted the raised areas with Tank Shades Die ink and cut the embossed leaves out. Next, I embossed only the dragonfly from the Embossing folder using white cardstock, and painted it with Creative Inspirations Paint-Canary. I added green and purple dots of Spica Glitter pen ink to the dragonfly next. Finally- I wanted to layer color under my background panel, and could not match up the colors, so I used the Distress inks to add color- in Mustard Seed and Dusty Concord. 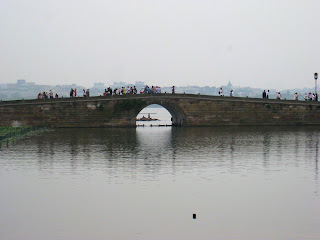 I tried to capture the boat thru the archway- the greenery to the Lt and under the bridge- fields of Lotus flowers. 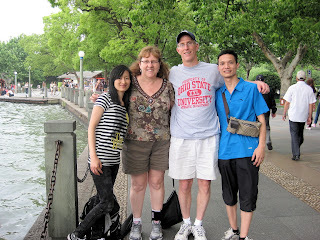 These are the young newlyweds we shared a boat ride with- of course, they spoke only Chinese too, we spoke only English...... but we all still enjoyed it. There was a musical fountain in the Lake that would play about every 30 minutes or so- it was really beautiful to see. I rec'd my swap ATC's and wanted to share them- they are fabulous IRL! The fern is Elmer's glue in a silicone mold- gorgeous! The BG has Elmers glue spread all over the BG- then is heated to create texture. Next is another fabulous textured BG by Yankee "Sheila-Rose"
The picture does not do it justice- the colors are all wonky...... Just gorgeous IRL with fabulous texture too. Next, Julie Bowman made a BG using Glue and Acrylic paint that crackled when it dried. She must have used Metalic paints, as the color peeking through is shimmery. SO pretty IRL! Next, Pat Hanbery used technique I have never heard of, but how cool is this? This picture- no way to capture this- the BG is foil glue and green glitter glue. The bear is 2 layers of paper bag- glued together. Alene's Tacky glue applied to both sides and held over a candle. Then, metallic wax was added as a highlight. Spectacular! Another cool technique-Photocopy of a distress ink clean-up towel then pattern added with PVA- Impression Obsession bird stamped over the top. Deb used Pearlex and glue- oh- it is really shimmery IRL- and more colorful than in the picture! The picture is horrible- the color is purple and I could not photo fix this...... but it is so cool, I thought I would show it anyway- the stars are stamped using a cookie cutter, and the dots with a pencil end. The next swap is using stencils...... If you would be interested in joining a great swap group, find Deb Lovett at the Rubberstampchat Ning......I am never disappointed. I made a background called Pulled Color from the latest Technique Junkies newsletter. I used Red and yellow/gold colors and some Pearl White Paint on the background. The image is from Rubberstamp Ave. Rubber Stamps- plate A76-I won it from the Technique Junkies. I colored it with Tim Holtz Distress markers. I added the Lace Corner die by Cheery Lynn Designs. This was made by Carla Carla van der Mei from the Netherlands. I joined a group of Oriental Art swappers. My daughter is teaching in China for a year, so I thought it would be a good opportunity to dust off all of my Asian themed images and put them to use. The streets have lanterns all of the way across- and for blocks, and there is Restaurant after Restaurant. There are tables and grills set up outside as well, and there are people everywhere, as well as street vendors. It was a great big huge street party. I looked into the archives of techniques at Technique Junkies, and found one I had never tried- Acetate Frost (2/2006). I added stickles to the front of the acetate and added Holographic cardstock behind the acetate- new at Sweet Stamps- how fun is that!